The English origin of the word, "ginger", is from the mid-14th century, from Old English gingifer, from Medieval Latin gingiber, from Greek zingiberis, from Prakrit (Middle Indic) singabera, from Sanskrit srngaveram, from srngam "horn" and vera- "body", from the shape of its root. The word probably was readopted in Middle English from Old French gingibre (modern French gingembre). Fresh ginger can be substituted for ground ginger at a ratio of six to one, although the flavors of fresh and dried ginger are somewhat different. Powdered dry ginger root is typically used as a flavoring for recipes such as gingerbread, cookies, crackers and cakes, ginger ale, and ginger beer. Candied ginger or crystallized ginger, known in the U.K. as "stem ginger", is the root cooked in sugar until soft, and is a type of confectionery. Fresh ginger may be peeled before eating. For longer-term storage, the ginger can be placed in a plastic bag and refrigerated or frozen. In Indian cuisine, ginger is a key ingredient, especially in thicker gravies, as well as in many other dishes, both vegetarian and meat-based. Ginger also has a role in traditional Ayurvedic medicine. It is an ingredient in traditional Indian drinks, both cold and hot, including spiced masala chai. Fresh ginger is one of the main spices used for making pulse and lentil curries and other vegetable preparations. Fresh ginger together with peeled garlic cloves is crushed or ground to form ginger garlic masala. Fresh, as well as dried, ginger is used to spice tea and coffee, especially in winter. In south India, "sambharam" is a summer yogurt drink made with ginger as a key ingredient, along with green chillies, salt and curry leaves. Ginger powder is used in food preparations intended primarily for pregnant or nursing women, the most popular one being katlu, which is a mixture of gum resin, ghee, nuts, and sugar. Ginger is also consumed in candied and pickled form. In Japan, ginger is pickled to make beni shōga and gari or grated and used raw on tofu or noodles. It is made into a candy called shoga no sato zuke. In the traditional Korean kimchi, ginger is either finely minced or just juiced to avoid the fibrous texture and added to the ingredients of the spicy paste just before the fermenting process. In Burma, ginger is called gyin. It is widely used in cooking and as a main ingredient in traditional medicines. It is consumed as a salad dish called gyin-thot, which consists of shredded ginger preserved in oil, with a variety of nuts and seeds. In Thailand' where it is called ขิง khing, it is used to make a ginger garlic paste in cooking. In Indonesia, a beverage called wedang jahe is made from ginger and palm sugar. Indonesians also use ground ginger root, called jahe, as a common ingredient in local recipes. In Malaysia, ginger is called halia and used in many kinds of dishes, especially soups. Called luya in the Philippines, ginger is a common ingredient in local dishes and is brewed as a tea called salabat. In Vietnam, the fresh leaves, finely chopped, can be added to shrimp-and-yam soup (canh khoai mỡ) as a top garnish and spice to add a much subtler flavor of ginger than the chopped root. In China, sliced or whole ginger root is often paired with savory dishes such as fish, and chopped ginger root is commonly paired with meat, when it is cooked. Candied ginger is sometimes a component of Chinese candy boxes, and a herbal tea can be prepared from ginger. Raw ginger juice can be used to set milk and make a desert, ginger milk curd. A dicotyledonous native species of eastern North America, Asarum canadense, is also known as "wild ginger", and its root has similar aromatic properties, but it is not related to true ginger. The plant contains aristolochic acid, a carcinogenic compound. The United States Food and Drug Administration warns that consumption of aristolochic acid-containing products is associated with "permanent kidney damage, sometimes resulting in kidney failure that has required kidney dialysis or kidney transplantation. In addition, some patients have developed certain types of cancers, most often occurring in the urinary tract." If consumed in reasonable quantities, ginger has few negative side effects. It is on the FDA's "generally recognized as safe" list, though it does interact with some medications, including the anticoagulant drug warfarin and the cardiovascular drug nifedipine. The characteristic fragrance and flavor of ginger result from volatile oils that compose 1-3% of the weight of fresh ginger, primarily consisting of zingerone, shogaols and gingerols with -gingerol (1--5-hydroxy-3-decanone) as the major pungent compound. 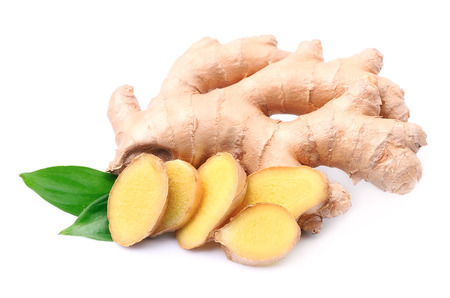 Zingerone is produced from gingerols during drying, having lower pungency and a spicy-sweet aroma. Shagoals are more pungent and have higher antioxidant activity but not found in raw ginger, but is formed from gingerols during heating, storage or via acidity. Fresh ginger also contains an enzyme zingibain which is a cysteine protease and has similar properties to rennet.